Released in 1964, [easyazon_link identifier=”B000055Y0X” locale=”US” tag=”rabidreaders-20″]Dr. Strangelove[/easyazon_link] is a dark comedy satire highlighting the Cold War paranoia of the era. 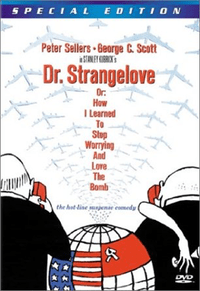 Starring Peter Sellers in three roles, George C. Scott, Sterling Hayden, Kennan Wynn and Slim Pickens, [easyazon_link identifier=”B000055Y0X” locale=”US” tag=”rabidreaders-20″]Dr. Strangelove[/easyazon_link] is critically acclaimed for its cold war and sexual themes. Topping the all-star cast is producer/director/writer Stanley Kubrick. The movie was loosely modeled after a thriller novel titled “Red Alert” by Welsh author, Peter George. Peter Sellers was a brilliant actor. The story goes that Columbia Pictures agreed to finance [easyazon_link identifier=”B000055Y0X” locale=”US” tag=”rabidreaders-20″]Dr. Strangelove[/easyazon_link] only if Sellers agreed to play multiple roles. Not only does Sellers show off his acting skills in the roles of Group Captain Lionel Mandrake, President Merkin Muffley and Dr. Strangelove, he also shows off his brilliance with accents. Sellers was originally cast in the role of the B-52 pilot, Major T.J. Kong, but after an injury on set, the part was given to western character actor, Slim Pickens. I think anyone watching [easyazon_link identifier=”B000055Y0X” locale=”US” tag=”rabidreaders-20″]Dr. Strangelove[/easyazon_link] would be hard pressed to picture anyone else doing credit to the role. It’s been said that Pickens was the character and his natural pattern on the screen gives legitimacy to an actor at ease with his counterpoint. [easyazon_link identifier=”B000055Y0X” locale=”US” tag=”rabidreaders-20″]Dr. Strangelove[/easyazon_link] is a comedy with a lot to say. The release of the movie was delayed almost a year as a result of the assassination of President John F. Kennedy. Despite the later release date, the themes of [easyazon_link identifier=”B000055Y0X” locale=”US” tag=”rabidreaders-20″]Dr. Strangelove[/easyazon_link] were spot on for the time. The group in the war room are frantically trying to stop the nuclear device while also making a plan for the continuation of Americans assuming that the Soviet Union will also make a similar plan and the tension would continue after society finds itself on its feet again. The idea is a very cold analysis of how the U.S. can come out on top when the superpowers rise again. There’s a sinister brutality to the way some of the ideas are presented. There’s certainly room to use [easyazon_link identifier=”B000055Y0X” locale=”US” tag=”rabidreaders-20″]Dr. Strangelove[/easyazon_link] as a mirror of our own times and the war against terrorism. If you’re looking for a funny, smart and thought-provoking way to spend an evening, give [easyazon_link identifier=”B000055Y0X” locale=”US” tag=”rabidreaders-20″]Dr. Strangelove[/easyazon_link] a shot. Love it or hate it, it should be watched at least once in each and every lifetime. Dr. Strangelove, Or: How I Learned to Stop Worrying and Love the Bomb (Special Edition) is available as a DVD, Blu-ray and Amazon Instant Video.